Wow! National Scrapbook Day was awesome. I scrapped for 15 hours straight and completed 14 layouts with three more almost done. What an amazing day! If there's a downside to National Scrapbook Day, it's that you can't be everywhere. I try to participate in as many online events as I can, but even with hopping around from site to site, I had to pick and choose among a bunch of great events. I spent most of my day working on challenges at Scrapbook.com, Scrapbook and Cards Today, Gossamer Blue and the Scrap Gals. I'll be sharing what I made over the next few weeks, starting a selfie challenge. The selfie challenge was timed, with a relatively luxurious 3 hours to complete a page using a selfie. That would have been no problem if I had a photo printer or printed selfies ready to go, but I didn't. At least, I didn't think I did. I went through my box of extra photos and found four selfies from way back and put them all together on a page. 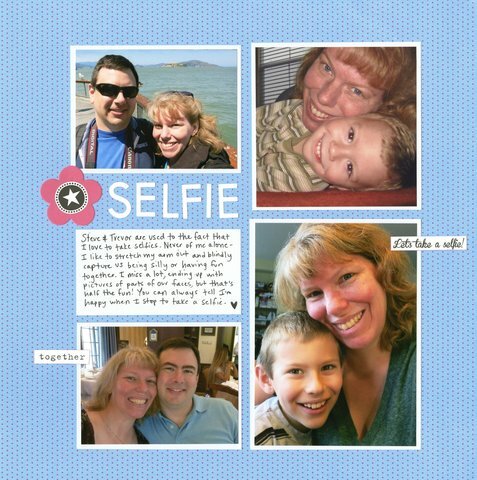 I'm experimenting with embedding my layout from Scrapbook.com instead of uploading it directly. That means that if you click the link, it will take you to my gallery where you will find the products I used. Those are affiliate links, meaning I will get a commission for anything you buy at Scrapbook.com after following my link. It won't cost you anything extra. I'm really happy with how my first layout turned out. It's clean, it's simple, the focus is on the photos, and I've told the story in my own handwriting. And bonus points for scrapping photos from the box of extras! Love it and for all the reasons you said... also because you brought together a mix of photos from different times and "events"! Actually, I don't work for Scrapbook.com anymore. You can embed your layouts. Just find the "link" button on your gallery and chose the html code (not the img code that you would use to embed in the forums). Copy and paste into the back end of the blog. The commission is because I am an affiliate for Scrapbook.com through Share a Sale. I don't know what your numbers/audience is like, but even small bloggers can have success with Share a Sale. Here's a link to see if you might want to become an affiliate too. I love this quick but awesome layout. And I love that I learned something about you that I didn't know before. Wow....you had a productive day. Glad you could improvise and use your extra photos - turned out awesome! I loveeeeeeeee this! LOVING those photos and the blue!!!!!!!!!!!!! !